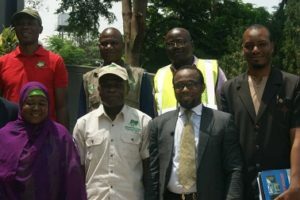 Obi Peter (second from right, front row) paid a courtesy visit to the DG of National Environmental Standards and Regulations Enforcement Agency (NESREA) Dr. Lawrence Anukam (second from left, front row) at the organization’s head office in Garki II Abuja recently. Dr Adigwe expressed his management’s resolve to position the institute to tap into available synergies and linkages with other government agencies so as to provide better service delivery to Nigerians. He informed DG NESREA on the accreditation status of NIPRD with ISO 9001:2008 and ISO 17025:2015 Quality Management Systems and Testing laboratory accreditation certification respectively. All these are endorsements of integrity and expertise in areas of quality assurance with highly skilled manpower power in the institute. Dr. Anukam expressed delight on the visit and informed that it was the first of its kind between the two agencies since their establishment. He assured NIPRD of NESREA’s commitments to mutually beneficial partnerships to actualise the core mandates of the organizations. The two agencies agreed to setting up a joint technical cooperation committee to draft a memoranda of Understanding to cover specific areas of collaborations. Such areas would include strengthening human capacity development through training, utilization of NIPRD state of the art fully ISO accredited laboratories for NESREA samples analysis, conducting joint epidemiological studies and development of Standard operating procedures and customized protocols for biodiversity and conservation regulations enforcement. Such increased synergy between both agencies will facilitate a speedy achievement of current Government objectives of improving human capacity building, ensuring access to good healthcare and creating more employment opportunities to Nigerians and save cost in executing public programmes thereby boosting local economy. Very assuring to see government agencies pulling their strength together to uplift the living standards of Nigerians. Kudos to the revelation agents for factual news dissemination.